I've determined that the best food in L.A. is either in Downtown L.A., Orange County, or in the San Gabriel Valley. All of which are at least an hour drive from me. Well, you gotta do what you gotta do for food. Organic food is the way to go! My favorite snack at Green Zone at Valley Blvd at San Gabriel is their fried salmon triangles on the left. 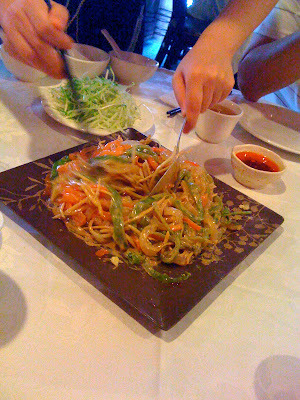 I've also determined finally, that I actually do not like their tofu as much as I did last time (middle picture). Anyways what brought me to Green Zone again this visit aside from their awesome dumplings and free refill Passionfruit Green Tea, was their Hainan Chicken Rice. There's been people raving that they have the best Hainan Chicken rice that even tops that of Savoy's. Their chicken rice wasn't bad but I don't know if I would say it's the best I've ever had. Hainan Chicken just needs to be eaten in Singapore. There's just no excuses. I did like how they were no bones in their chicken though. It made it easier to eat. My mom makes amazing chicken rice. I think she could give any place a run for their money except she doesn't and will never be able to master the art of cutting a chicken. Her pieces of chicken are the size of the whole plate. Major Fail. We usually make a day trip out of SGV visits and buy a crap load of food since we have to drive so far for it. Look familiar? These rice balls are filled with drugs or something. They are delicious but you can't buy them from a restaurant or Japanese market. Why? Apparently I can't give you the address of where to get these because you have to call a number and order in mass numbers. Some person is making it from their house. Sketchy and awesome! By the way, these are also ingenious. You see the arrows in the first picture? That tells you how to unwrap your ball of rice. The wrapper is engineered so that the seaweed doesn't get soggy from touching the rice or the meat. 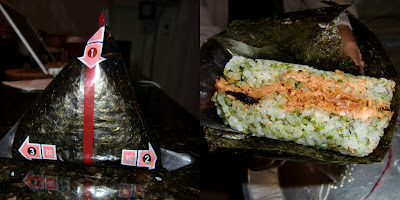 It's hard to explain, but basically there's a layer of the wrapper that keeps it from hitting the rice and you keep scooting the seaweed over so that you can get a mouthful of the rice, salmon, & crunchy seaweed. Next stop was Momo's Bakery in Alhambra. They used to be an awesome bakery when they were Kiki's Bakery. Ever since they've become Momo's, their cakes have totally tanked. 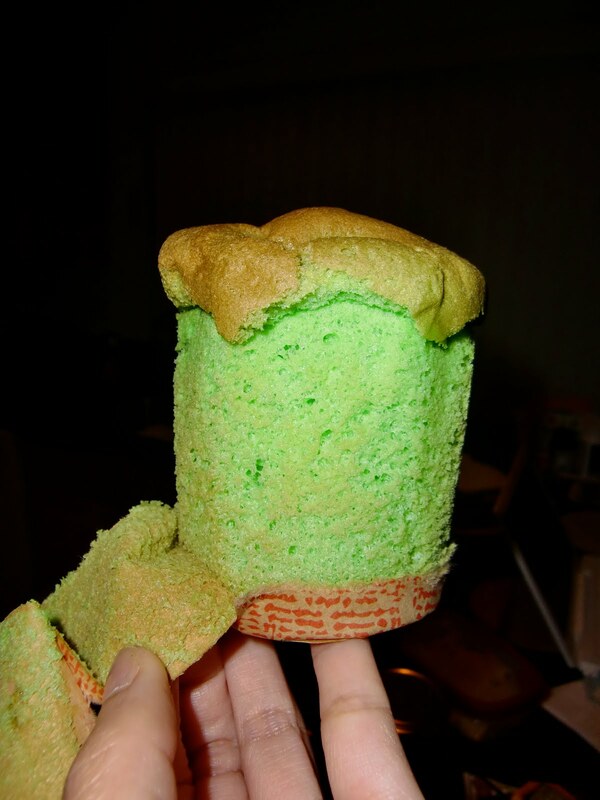 But one thing has stayed the same-their pandan sponge cakes! Delicious! That's right. That green color is all natural! Delicious! Here's a place I haven't posted on yet. Duck House at 501 South Atlantic Blvd. Monterey Park. This location isn't as good as their old location but I guess that's what happens when someone gets gunned down in the parking lot-your restaurant loses customers and they close down. 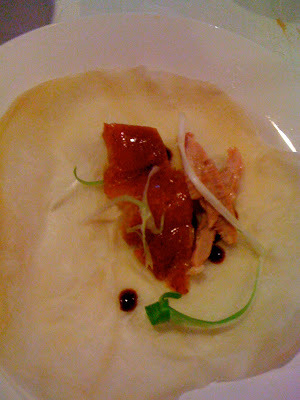 =[ This is definitely not the best Peiking Duck I've ever had but it's decent for being in LA. Be sure to call at least an hour in advanced so they can prepare it for you. They run out of ducks often so be prepared to have a back up restaurant in case that happens to you. Above is their salad with sesame sauce that is really good. Here's the duck. All the meat is separated for you. It's also nice that instead of those huge white buns, they give you little mini tortilla thingys. Much tastier. If you have a big party with you, you can also choose to get duck bean sprouts and duck soup as well. And your finished product should look something like this before you wrap up all the goodness. Yum. Feb 5 Fusion or Not, Japanese Food is Delicious!